Once again, Iowa Democrats enter another campaign cycle in which their majority in the State Senate, their last bastion of power in state government, holds on by a 26-24 margin. Democrats can’t afford to lose a single seat, or if so, they must pick up another seat elsewhere in a tough district. The difference between Iowa becoming an all-Republican governed state comes down to a handful of local legislative races in districts of only about 60,000 people each. So let’s take a look ahead to these important looming campaigns. And a note on the rankings – this far out, with few announced (or even rumored) challengers to many incumbents, I’m ranking this on which districts will be the most competitive, and not necessarily which ones are most likely to flip. 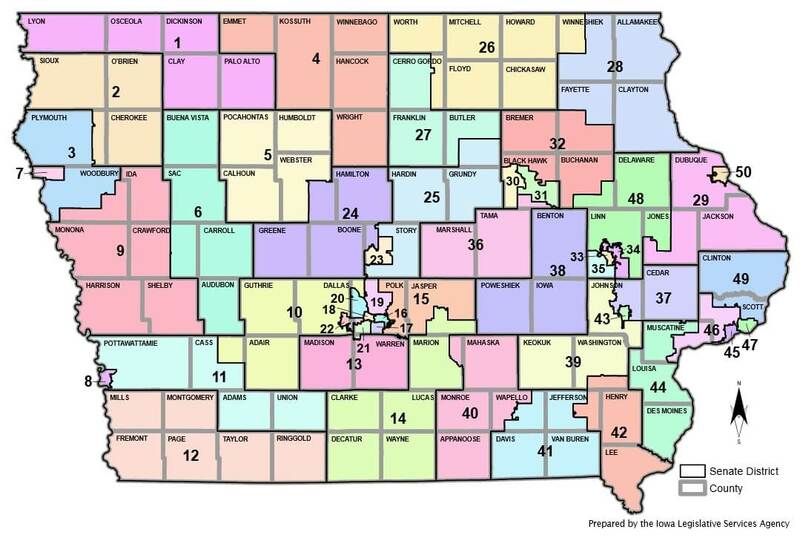 See the full Iowa Senate map here for reference, and the individual district maps here. This Muscatine/Scott County-based seat will feature the biggest legislative battle royale of 2016. Republicans scored an important early recruitment victory in getting Lofgren to challenge first-term Democrat Chris Brase. Lofgren served two terms as the State Representative for Muscatine, before running unsuccessfully against Marianette Miller-Meeks in the Republican primary for Congress. Starting Line also hears Lofgren’s wife recently got a job in the Eldridge schools, giving them new connections in the Scott County side of the district. Brase’s background as a firefighter serves him well on the campaign trail, and he ousted an incumbent in his first big win in 2012. The district is about as close of an even-split registration-wise as you get in Iowa, and there’s several Democrat-heavy Davenport precincts in this district that can be turned out. 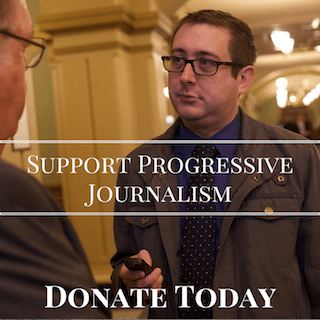 Both Brase and Lofgren are tenacious campaigners – expect District 46 to be the most closely-watched and most expensive legislative race in Iowa. 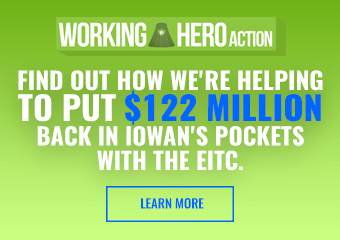 The district that covers most of the four counties in Iowa’s Northeast corner will be a top target once again in 2016. Breitbach eked out a victory for an open seat last time by a mere 17 votes. He benefited in 2012 by being a candidate with little public background or voting record. After his first term in the Senate he’ll have a lot of tough votes on important issues he’ll have to own. It’s also entirely possible people thought they were voting for the owner of the popular Breitbach’s Country Dining restaurant in nearby Balltown – they might know differently by this time around. The registration totals here don’t tell the whole story – even though Republicans outnumber Democrats by about 3,400, this part of the state often goes with the Democrats. Obama got over 53% here in 2012, and the legislative districts here flip back and forth. Democrat State Representative Patti Ruff picked up and held the House district in the eastern half of this Senate District. Ruff does a great job in the House, but you know what has a nice ring to it? Senator Patti Ruff. Republicans will no doubt want to find a top-tier challenger for this northern Iowa swing district. But Mary Jo Wilhelm is a giant-killer, having knocked off two different Republican incumbents in her previous victories, and taking this seat away from Democrats won’t be easy. It was the crucial win in 2012 that retained Democratic control of the Senate, with Wilhelm beating Senator Merlin Bartz by 126 votes. Wilhelm also benefits from Kurt Meyer’s leadership in the district – his Tri-County Democrats organization that covers half the Senate district has seen considerable success in rural areas that could have been lost to Republicans. 3 of the 4 rural counties in the entire state that backed Bruce Braley over Joni Ernst lie in Wilhelm’s district (Howard, Floyd and Worth). The district is spread out over 7 counties, with Charles City (population 7,600) the largest town. Those rural communities will see lots of campaign activity in 2016, but Republicans would have to find someone awfully well-known to have a good shot at this race. It’s a lot of turf to cover. Some may wonder why this district is so high up, but this is Starting Line’s upset surprise pick for 2016. Guth only won by 1,734 votes in 2012, the 5th-smallest margin among State Senate races that year. This district covers the rural counties west of Mason City, and typically goes Republican for statewide races, but has seen Democrats do well in local contests. Most importantly, Guth has distinguished himself as one of the most partisan, hard-line conservatives in the Senate, often on the losing end of 40-10 or 42-8 type votes. He’s known locally as “Goofy” Guth, a sign his outspoken antics have been well-known for some time. If Democrats get a good candidate up here – and I think they will – this race will become a major headache for Republicans. Republicans will look at Danielson’s past close calls and think they could have another shot here. He won with just over 20 votes in 2008 and a healthier 681 votes in 2012. 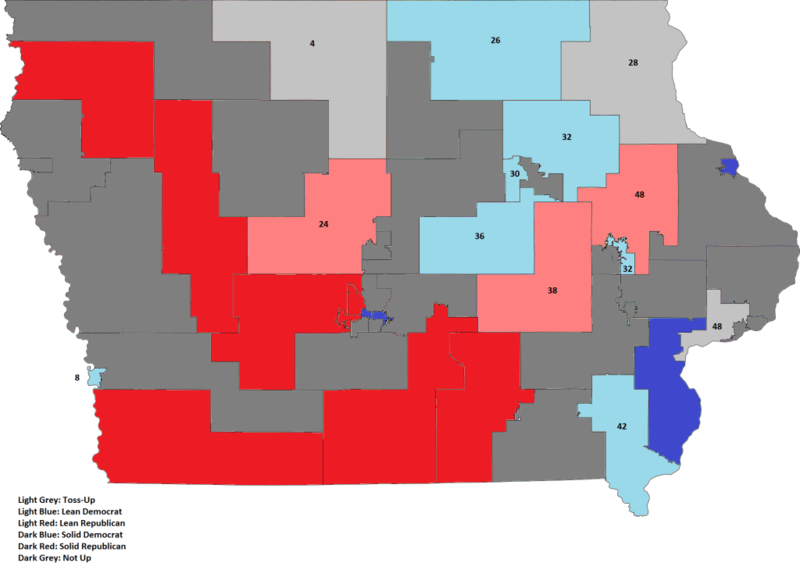 Danielson’s held his Cedar Falls-based district for some time now, however, and will likely increase on those margins unless Republicans recruit a really impressive candidate (or convince Walt Rogers, now in the House, into a rematch). Either way, this will likely be another major battleground. UNI students gave Danielson crucial boosts in the past – with presidential campaigns and issue groups focusing heavily on Iowa campuses, he may see an even higher student turnout this time around. Another evenly-matched swing district, Schoenjahn has served in the Legislature since 2005. He won by just under 2,000 votes in 2012 against a not-very-serious opponent. Republicans may find a better challenger this time, but it would be near impossible to out-work Schoenjahn, one of the Democrats’ best campaigners who knocks the hell out of the doors in his district. Still, put enough money into this rural district to the Northeast of Waterloo and this could turn into a real race. In case you noticed, this makes 4 of the top 6 State Senate races located in the 1st District, which will see an exciting Democratic primary and probably be the top targeted pickup Congressional district in the entire country. That should ensure turnout help for many of these Democrats. How long national Republicans stick with Rod Blum may have a big impact on the down-ballot races here. Republicans would so much love to finally defeat Mike Gronstal, the man who’s stymied conservative legislative proposals for years. They thought they had a good challenger in 2012 when they got an Air Force Colonel, but he fizzled out. Most Republicans will privately admit they have little hope of actually picking up the Council Bluffs seat as long as Gronstal is there, but they’ll likely still give it a legitimate effort. The Southeast corner of Iowa could see an important legislative matchup in this Democratic-leaning district. Republicans will need to recruit an opponent for Taylor with a little more charisma this time. Taylor hails from the Republican portion of the district in Mt. Pleasant/Henry County, giving him a good home field advantage in an area Democrats would normally get blown out in. Add that to the heavily-Democratic precincts in Ft. Madison and Keokuk, and Taylor will have a leg up going into reelection. Also noteworthy – he faced a third party opponent from Mt. Pleasant in 2012, which ate up some of his votes from home. That probably won’t be an issue this time. Zumbach only won by 557 votes in 2012, the 3rd-closest Iowa Senate margin that year. But he’s well-positioned in his district, locking down the votes in his home Delaware County, and having to do just well enough elsewhere to win. This race could shoot up the list if Democrats find a solid candidate here. Sheriff’s Deputy Steve Sodders has been holding down this Marshalltown-based district for some time now, and he’ll be tough to beat in 2016. He dispatched perennial candidate Jane Jech last time by 2,373 votes, but will likely face more serious competition this time. With the Clinton campaign’s increased focus on turning out Hispanic voters, Marshalltown could see a surge in new Democratic voters. Just look at all those No Party voters. Now we’re into the territory of districts that Democrats could have a chance at, but only with a really outstanding candidate. There’s plenty of potentials in this Benton/Iowa/Poweshiek County district. Democrats used to win key legislative races in this area with the support of the students at Grinnell. Kapucian very well may find himself in a highly competitive race in 2016. Starting Line hears former Minority Leader Jerry Behn may be thinking about retirement. 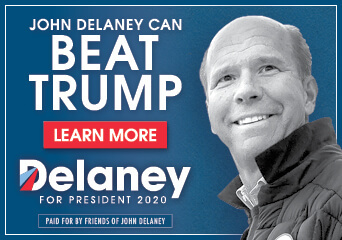 If he does, this will be a very tempting open seat for Democrats to take a stab at. This is actually a doable district for Democrats with the right candidate. Sinclair, Republicans’ sole female Senator, comes from Wayne County, one of the smaller ones in the district. She’s taken an awfully conservative tack at the Statehouse. If Democrats had tons of money to throw at TV ads in the Des Moines market, you could probably beat her with a well-cut ad from a video of Sinclair that Starting Line knows about. Certainly there’s a strong community/business leader Republicans could run against Mathis. The hard part will be convincing them to do so. Mathis is too well-liked, too well-connected in the Marion area to lose this key seat Democrats control. She over-performed Obama by nearly 10% in 2012, in the suburban type of precincts that Obama already over-performed registration numbers himself. The interesting thing here will be to see just how concerned Republicans are about whether Mathis may run for a statewide office in the future – would they spend some extra money on attack ads to see if they could weaken her up a bit? Probably not, as money will be spread out among other crucial districts, but Republicans might make some sort of extra effort here. Actually, if they’re really worried about Mathis, they may not want to give her a big race at all – it would just give her an excuse to run her own TV ads. For my part, I just hope Republicans give us all another gem of a candidate like one of their last District 34 challengers, Randi Shannon. She ran against Mathis until July, when she decided to drop out of the race to take a place as a U.S. Senator in a completely made-up “Republic of the United States of America” that some Ron Paul backers created. It was quite possibly the most insane story ever in Iowa politics – if you don’t know about it, read it here. This is a pretty Republican seat, but keep your eye on it all the same for right now. Democrats got a very interesting candidate there in Miyoko Hikiji, a decorated U.S. Army and National Guard veteran and author. More on her later. Zaun hasn’t ruled out primary-ing Congressman David Young, adding another wrinkle to this contest based in Urbandale. NEXT POST Next post: The Backlash Is Coming: Which Republican Will Capture It? Isn’t Liz Mathis likely to run for US Congress?